Simple tips to help you conquer your mornings, make your routine easier and be more productive without the stress. For many years, I struggled with what I like to refer to as “the morning mad rush”. The stress of getting everyone ready, while kids yelled about missing socks, was not my definition of “rise and shine”. I just wanted to slip back under the covers and hope no one missed me. But after a few simple tweaks, mornings became my favorite part of the day. Today I’m sharing a few simple tips to help you set a morning routine that works for your family so you can kick-start your day on a positive note. Every night I make sure to wash all the dishes, clean up the kitchen, do a quick pick up around the house and put things away. This little step helps me tremendously the next day. I simply can’t focus if I wake up to a mess. So making sure that these tasks are always done, helps me get off to a great start. If your kids are in school, ask them to pull out their clothes the night before. If you have an outside the home job or leave for any other reason, you should also do the same. You can also have backpacks ready to go and lunches packed. If you have a crockpot, you can also start breakfast the night before and have it ready by the time you wake up. Not only will your family be a step ahead, but your morning will also go much smoother. I’m definitely not a morning person, but I force myself to get up earlier than the rest of my family. Getting up a little earlier helps me get the quiet time I need to work uninterrupted for a few hours. It also enables me to start a load of laundry, take a quick shower, enjoy a cup of coffee, and answer emails. 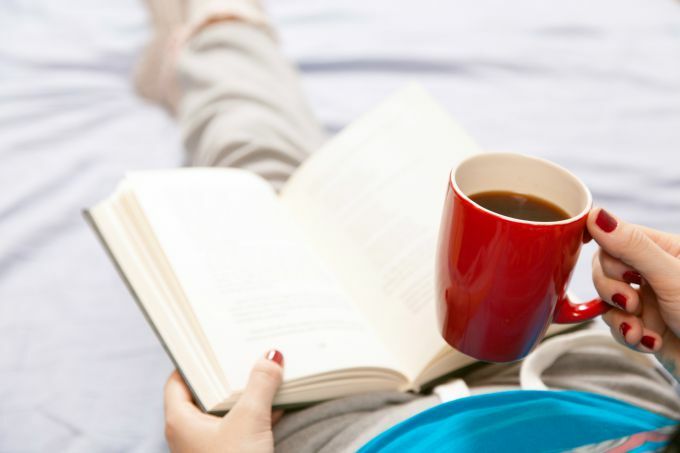 I cherish my quiet time each morning, and although I would much rather stay in bed a little longer, I know that my efforts will give me a head start to a productive day. Find something that you can look forward to each morning to help you get out of bed. If all I would think about is my long to-do list, I’d probably stay in bed in hopes of avoiding it altogether. However, I know that each morning I get to enjoy a hot cup of coffee and write and read scripture uninterrupted. This helps set the tone for the day and serves as an incentive to get up earlier. For you, it may be going for a walk in the morning, or simply being able to get yourself ready without any interruptions. Find something that will help motivate you and make it part of your daily routine. Every morning I do a brain dump. I write down the things I have to do that day and the things I want to do if I’m able to. This allows me to plan out my day and have some structure. For example, if I write down that I need to stop at the grocery store and need to drop off mail at the post office, I can schedule my day around that. Seems silly, but I find that if I don’t write it down I’ll either forget or wind up going when it’s inconvenient for our family. I also find that having a to-do list, helps me stay on task each day. You can’t do it all. I repeat, you can’t do it all. Many moms today are burned out because they are taking on too much. And taking on more than we can handle is a recipe for disaster. We wind up stressed and overwhelmed because we try to live up to some crazy standard that is simply not realistic. Need help? Ask your family to help out with morning tasks. Kids that are older can dress themselves, fix their own beds, and make their own breakfast. After breakfast, they can also help wash their own dishes and wipe up their messes. It only takes a few minutes and it will help alleviate some of the pressure. My husband has taken on the task of making breakfast for us every morning. He also makes the bed if he knows that I’m busy working on a project. It might seem small, but it helps me in a huge way. Busy mornings is not the time to become a short order cook and start catering to everyone’s requests. Find a few simple breakfast recipes that everyone enjoys and rotate them throughout the week. In our home, it’s cereal, eggs with turkey bacon, waffles with turkey bacon or pancakes. If I can grab some breakfast sandwiches on sale we include those as well. Don’t make breakfast more complicated than it should be by giving your family a variety of options. 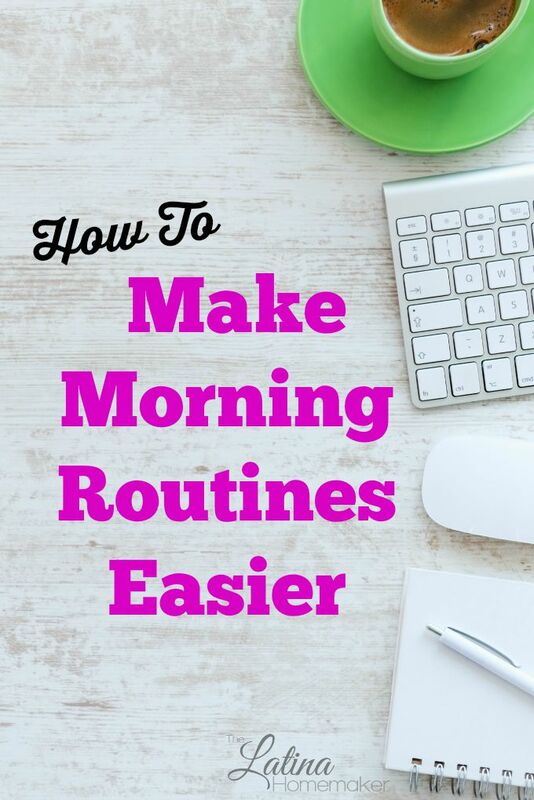 What are some of your favorite ways to make morning routines easier? I would love it if you shared your tips! Agree 100% on starting the night before and writing a to-do list (though, I do that the night before). For me, waking up knowing what I am going to be doing first thing means I am much more likely to actually get up and get at it. If I wake up and have no concrete plans for the day, sleeping in is always a “better” option than getting up and trying to figure out how to start the day! That’s great you write yours the night before. I find that by by nighttime my brain is mush, so I can’t even form intelligent thoughts…lol. But I’m sure it makes your mornings a lot easier. Thanks for sharing!